The answer to the first question is this dish here, and the answer to the second is no. And just to elaborate, I’ve never made toasties for dinner but I sure ate them a lot in the MasterChef house when we came home exhausted after a day of filming and there were twenty other people in the kitchen trying to cook their dinners. 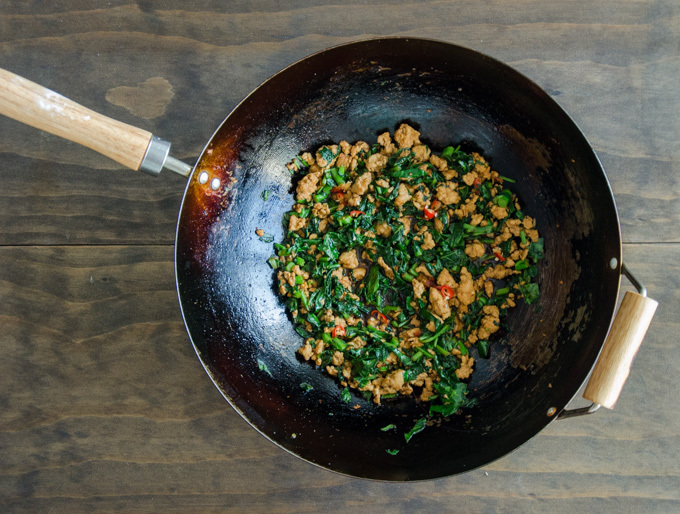 When I’m looking for a really quick and simple dinner, I often turn to my wok. It’s a cheapie at under $13, and probably one of my favourite pieces of kitchen equipment. The carbon steel heats up quickly and the wok is a grey black, seasoned from years of use. In the time it takes rice to cook, any manner of stir fries are ready to hit the table but it is most often this one. 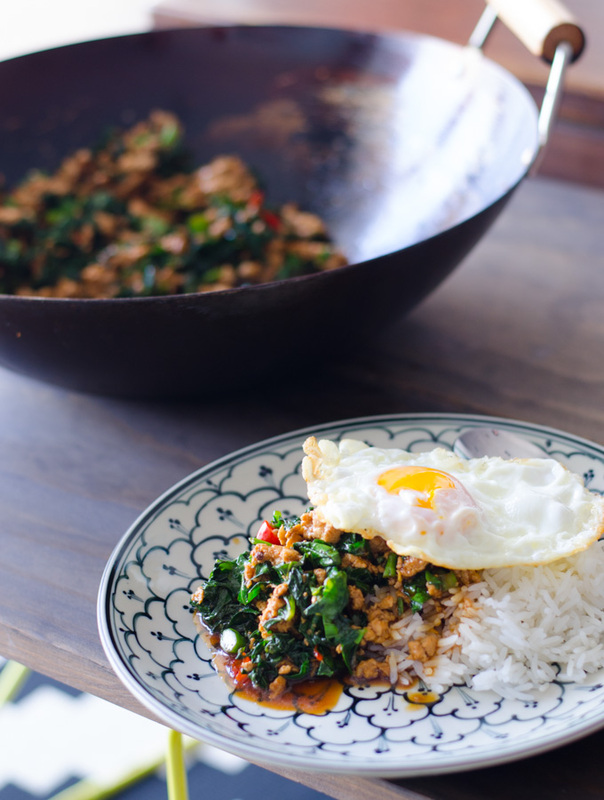 It’s a lazy evolution of a Thai classic, I’ve just added greens to make it a complete meal. If an Aussie kids’ food memory is biting into a sausage roll with tomato sauce, mine is crispy fried egg, runny yolk and dark soy sauce dripping onto fluffy steamed rice. It must be pointed out that purists maintain that oyster sauce and soy sauce — two ingredients that are almost always added to Pad Ka-Prao — should not be used. You can certainly go that route in which case omit the dark soy sauce and oyster sauce in the recipe below and add to the stir-fry just fish sauce (and perhaps a tiny bit of palm sugar) to taste. However, chances are the Pad Ka-Prao which you have fallen in love with isn’t made by purists. So, in order to come up with a homemade version similar to what you’ve had at a street food stall or restaurant, you’re going to need soy sauce and oyster sauce. Your call. Once upon a time, I used to cook this dish religiously by the book. Fish sauce, chicken only, Thai holy basil. Over the years it’s evolved to include whatever is in the fridge or garden whether that’s tofu, pork mince, Thai sweet basil or no basil at all. I should probably mention that I don’t think it would taste good with the Italian variety basil, but feel free to prove me wrong. Put your rice on to cook first - the stir fry will be done just as the rice finished cooking. If you're going to eat this with crispy fried egg, start with frying the egg. This way there's only one wok to clean up after cooking. Heat the wok until smoking, then add 2 tbsp oil and cook until crispy on the edges but the yolk is still runny. Set egg aside. 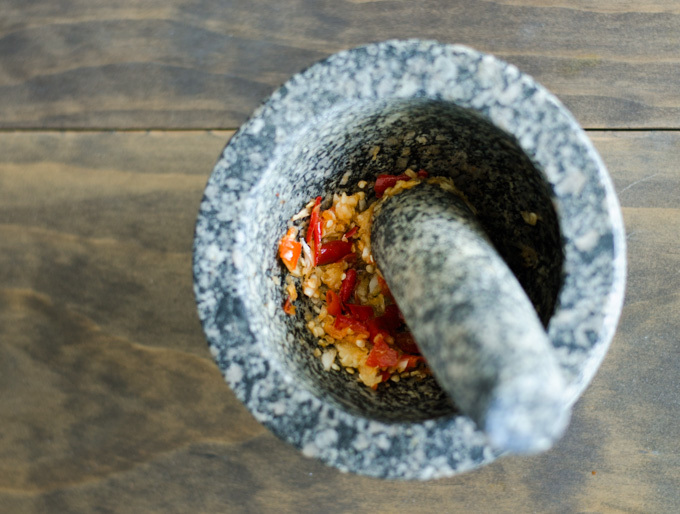 Pound garlic and chillies in a mortar and pestle or just cut finely with a knife until most of the garlic is broken up - you don't want to get big pieces of garlic in a mouthful. Using remaining oil in the wok (add more to become 1 tbsp if needed), heat until lightly smoking then add the garlic and chillis and cook for about 10 seconds making sure to stir so they don't catch on the bottom. Add the chicken and cook for about 1-2 minutes until mostly cooked through. Add the vegetables and allow to wilt (add a tablespoon or two of water if ingredients are catching on the wok). Add the sauces and continue to stir through, another 1-2 minutes. If you like a thicker sauce use a cornstarch slurry to thicken. Finally, add the holy basil and turn off the heat - the residual heat will cook the leaves through and release the aroma. Serve with rice and fried egg. I am making this! No, I really am….. I love when people make my recipes. I’ve bought purple basil (closest substitute, or omit altogether) from Kollupitiya market before and can give you some Thai basil seeds for your garden.